La instalación de cristal realizada por el arquitecto estadounidense Richard Meier para cubrir el Ara Pacis de Roma, el altar construido como forma de festejar el regreso del emperador Augusto tras sus victoriosas campañas, fue inaugurada hoy ocho años después de que comenzasen las obras de construcción. La instalación, que parece una pecera enorme y que contendrá el histórico altar, realizado entre el 13 y el 9 antes de Cristo y considerado único en su género por sus valioso bajorrelieves, fue inaugurada hoy por el arquitecto de Nueva York, ideador del museo Getty de Los Angeles, y el alcalde de Roma, Walter Veltroni. La obra ha sido muchas veces criticada no sólo por que la tardanza en su construcción, que ha privado durante ocho años a los turistas y ciudadanos italianos la posibilidad de contemplar el Ara Pacis, sino también por la modernidad de la construcción que resalta respecto al resto de monumentos de la zona, como el Mausoleo de Augusto. Es un horror inmenso firmado por un arquitecto incapaz al que han pagado dos millones de euros, no hay palabras para describir lo que han hecho. Quitemos el Ara Pacis de allí y hagamos una pizzería, dijo hoy uno de los críticos de arte más conocidos del país, Vittorio Sgarbi, que fue subsecretario del Ministerio de Cultura durante los primeros años del gobierno de Silvio Berlusconi. La pecera que alojará el Museo del Ara Pacis tiene una dimensión de 1.500 metros cuadrados y el exterior es de vidrio y acero, lo que permitirá la visión desde el exterior de la obra, y está coronado por un techo bajo y plano que se extenderá junto al río Tiber. Sustituirá a la estructura de mármol de estilo racionalista, típico de la época del dictador Benito Musssolini, realizado por Vittorio Morpurgo, que hasta ahora servía para proteger el monumento. Pero sobre todo se ha criticado que la instalación costara 40 millones de euros. La estructura aún no ha sido terminada y las obras concluirán definitivamente el próximo julio, aunque los turistas y visitantes podrán desde hoy visitar el monumento, pues aún se tienen que completar la sala de conferencias y el auditorio previsto. Hoy restituimos a los ciudadanos romanos y a todo el mundo el Ara Pacis, símbolo de una Roma que es antigua y moderna, explico Veltroni, que quiso inaugurarla hoy en coincidencia con la fecha del nacimiento de Roma. El alcalde explicó que el proyecto, ha sido muy discutido, como son discutidas las grandes obras pero que entra dentro de un plan de recalificación comenzado por el anterior alcalde, Francesco Rutelli, para convertir la zona en un lugar más vivible. El arquitecto Richard Meyer comentó que para él fue muy gratificante el haber construido este símbolo de paz y comentó que este trabajo hará aún más grande este ciudad. Por su parte el ex alcalde de Roma y ahora líder del partido La Margarita, Rutelli, afirmó que le parecía precioso y añadió que las polémicas siempre surgen pero que al final hay que mirar los resultados. El Ara Pacis es un monumento conmemorativo ordenado por el Senado en acción de gracias por el regreso del emperador Augusto tras sus victoriosas campañas en Hispania y Galia, y la paz que éste había impuesto. El material utilizado es mármol de Carrara, y lo más destacado es la decoración escultórica que recubre el edificio, sobre todo los frisos laterales, que representan a Augusto, su familia, amigos, magistrados y senadores, componiendo un magnífico conjunto de retratos. (see main item on site) (ANSA) - Rome, April 21 - Romes new home for the Ara Pacis has had a troubled history since award-winning US architect Richard Meier won the commission in 1995. Its early detractors were swatted away by confident former mayor Francesco Rutelli, on a wave of excitement about the stately old lady finally getting a modern addition to its Baroque heritage. But opposition built after Mayor Walter Veltroni replaced Rutelli in 2001, as Silvio Berlusconis new government took up the baton of protest. One of the fiercest opponents of the design was controversial Italian art historian Vittorio Sgarbi, who burned a model of Meiers building in the Rome square next to the Ara Pacis. As culture undersecretary from 2001 to 2003, the flamboyant polemicist threatened hunger strikes, urged art students to bomb the site, and punned that Meier was set on turning the Ara Pacis into a bara Pacis (coffin of peace) . He accused Meier of "knowing Rome the way I know Tibet". But Sgarbi, though the most strident, was not alone in opposing the building. A groundswell of protest rose among Italian name architects, who recently cited it as an example of alleged moves to Los Angelise Rome. Others muttered the relatively simple original design has morphed into a grandiose complex eight times bigger than what it is replacing. Media critics were split, with some hailing it as a welcome piece of understated modernism in a florid Baroque city, and others as wholly out of step with its surroundings. The latest threat to the much-tweaked complex came just before Fridays inauguration, when rightwing mayoral candidate Gianni Alemanno pledged to rip it down and replace it with something like the simple, glass Fascist-era showcase it supplanted. Ordinary Romans had no trouble saying what they thought about the project right from the start. Even when it was in its infancy, and the Meier box could only be glimpsed through corrugated iron sheets and scaffolding, they smeared the site with graffiti calling it a phonebox, gas station and "cesso" - the most vulgar Italian word for toilet. (ANSA) - Rome, April 21 - A new home for the Roman Empires most famous peace symbol was unveiled on Friday after a turbulent seven years of building, polemics and alterations. "We are giving the Ara Pacis back to the citizens of Rome, at once an ancient and modern monument," said Rome Mayor Walter Veltroni, who has championed US architect Richard Meiers ultramodern showcase since his election as mayor five years ago . Speaking on Romes traditional birthday - the 2,759th anniversary of its mythical foundation - the centre-left mayor promised work to "integrate" the building into its surroundings. Meier said he was "delighted" to have finally completed the project - Romes first piece of modern architecture since Fascist days - for "such a great, grand city". "I hope that the people who come here will get a sense of peace and serenity," he added. Media crews from all over the world snapped away as Veltroni cut the ribbon, while in the background a group of rightwing National Alliance (AN) party protesters waved Italian and black flags. The building has still to be completed with an indoor auditorium and a fountain, expected to be finished in a matter of months. But it is already facing its latest threat, from the AN candidate to run Rome. Gianni Alemanno wants to dismantle the building, put it in the Roman outskirts and replace it with something more like the simple, glass Fascist-era showcase it supplanted. Veltronis camp has blasted Alemannos "extremist" and "absurd" proposal. But the cultural heritage body Italia Nostra came out with a fresh denunciation of the "inappropriate" work. Meiers design, the first piece of modern architecture in Romes historic centre since Fascist days, has had to be changed several times since Meier won the contract in 1995 - six years before Veltronis election. Earlier this year, in the latest change, Meier said he was happy to put a piece of old Rome into the ultramodern site - a move some saw as a sop to critics. Meier was also "delighted" with Veltronis announcement of an international competition for projects to integrate the Ara Pacis with the surrounding square. The final version of the building has a museum, auditorium, restaurant, bar, 300-seater theatre and underpass leading to the Tiber. 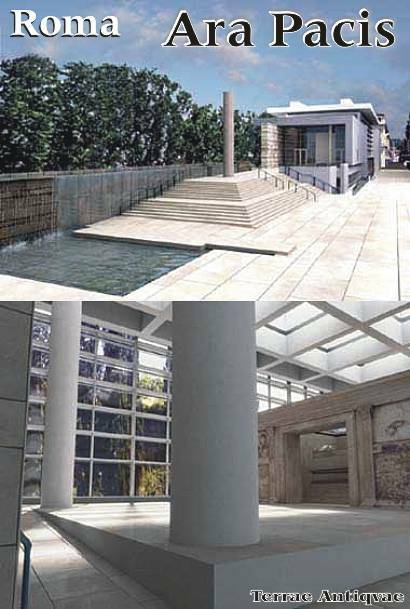 To give old-style distinction to the site, Meier has also added a grand travertine entrance stairway and a Roman-style monolith pointing towards Augustuss ancient Roman meridian, the point in the old Camp of Mars - now near the premiers office - where legions had to lay down arms if they were to be allowed into the city. A recipient of architectures prime laurel, the Pritzker Prize, in 1985, Meier has been mentioned in the same breath as Britains Norman Foster and Italys Renzo Piano, the high priests of modernism. His credits include the Getty Center in Los Angeles, Barcelonas Museum of Contemporary Art and Frankfurts Museum of the Arts. The altar was commissioned in 13 BCE to celebrate peace throughout the Roman Empire. It was completed in 9 BCE, 23 years before Augustuss death at the age of 76 in 14 CE (AD). The architectural hub of Ancient Rome, circled by a bas relief of a procession of peace showing Aeneas, the Earth, Italy and Rome, it marked the first emperors victorious return from Spain and Gaul and celebrated the peace he had restored to the empire. According to a tradition launched by Roman writers, Rome was founded by Romulus, a descendant of the Trojan hero Aeneas, in 753 BCE.